Welcome to Day 5 of our A Very Toddler Easter series that we are co-hosting with Susie from Busy Toddler. Today is our last day of this series!! 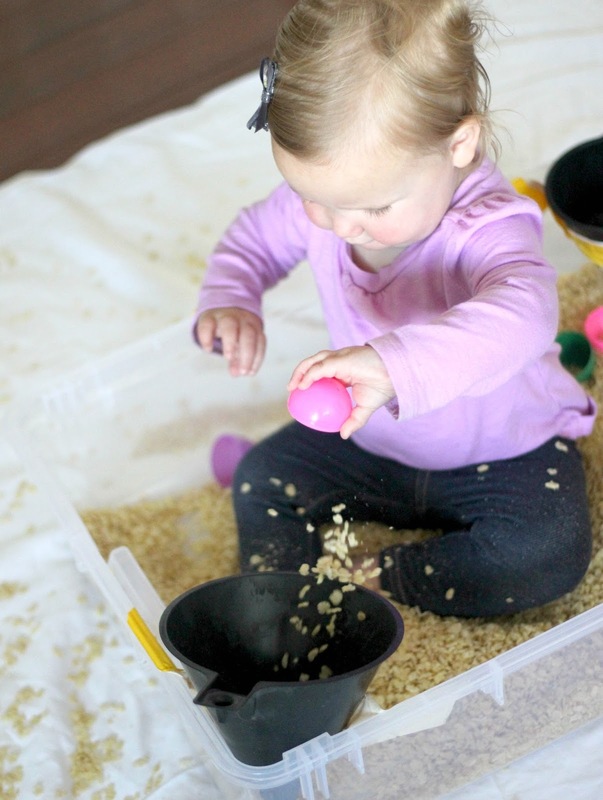 You can find ALL ten activity ideas that we've shared this week on our A Very Toddler Easter landing page. I am so sad it is over! Hopefully this gives you some fun things to try this weekend! 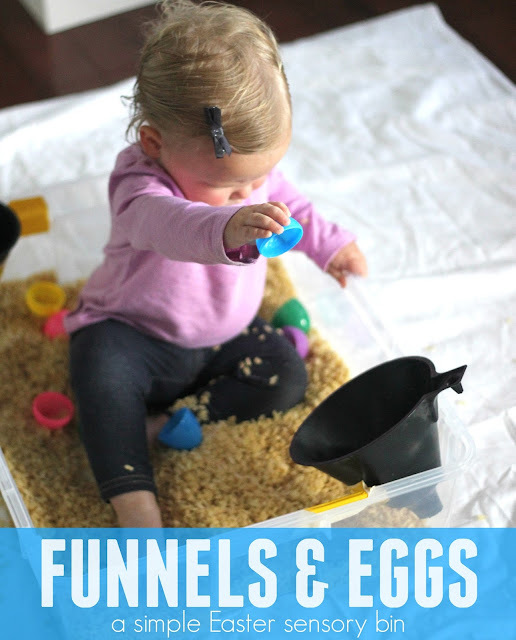 We are a bit obsessed with sensory bins lately and we were inspired by the PVC pipe and funnel sensory bin shared by Frugal Fun for Boys, so we made our own Easter themed sensory bin with funnels! I did not have enough time to grab and assemble PVC pipe this week, but I DID use a saw for the first time to set up these funnels, so I'm feeling pretty handy! GRAB SOME FUNNELS & DUCT TAPE! 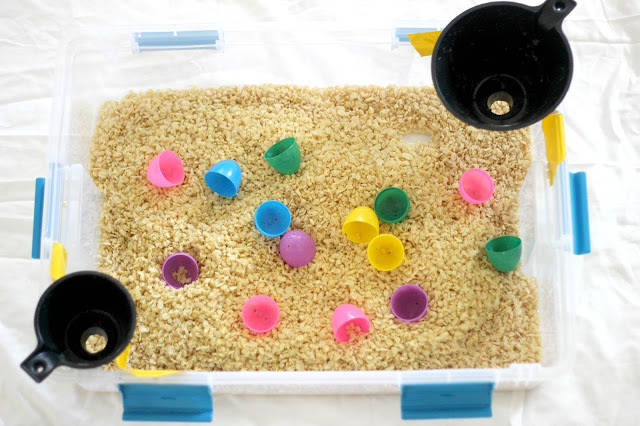 To assembly this super easy Easter Sensory bin you only need a few materials. Funnels sometimes have super small holes, so you may want grab a saw to shave off the end and make the funnel's hole bigger- that's what I did! To set up, use DUCT tape to secure your funnels into the corners of your sensory bin. You could use more intense tools to make them more secure... but we didn't and they survived my crazy kids... so you can always keep it easy like I did. 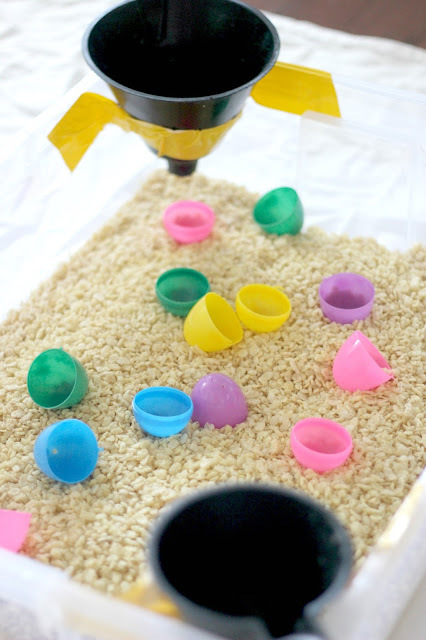 Once your funnels are secure, pour in some rice crispies and plastic eggs and tell the kids to start playing! 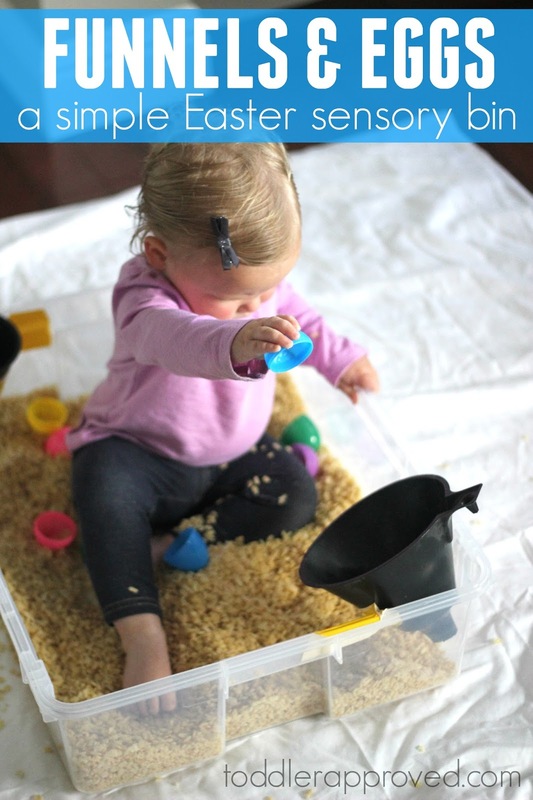 With sensory bins I like to set up rules when we start (for my bigger kids) and encourage my toddler to follow along too. If she starts pouring the cereal OUTSIDE of the bins, I show her where to pour it instead (INSIDE) and make that seem so fun that she wants to copy me. It works like a charm almost 90% of the time. 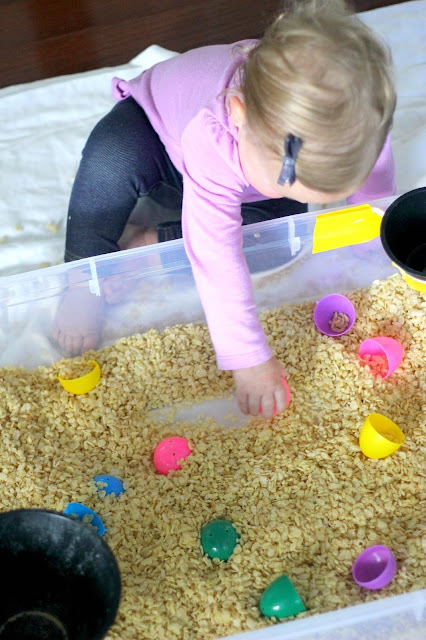 We scooped and dumped with the plastic eggs and we poured the cereal down the funnels. 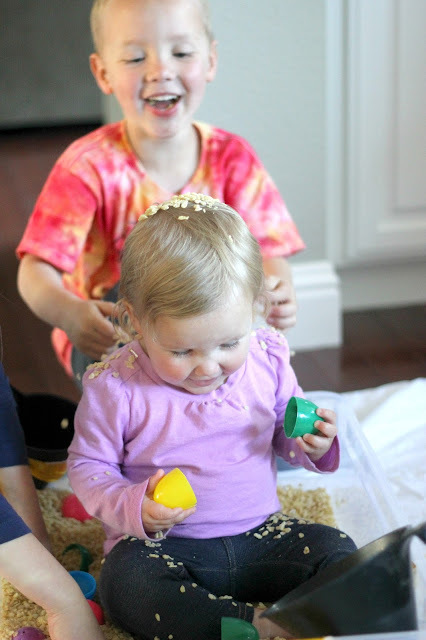 The eggs were a lot of help to move the cereal to the funnels. We might also call this her official "snack bin" since she took a break every now and then to grab a snack. At our house, I don't mind this. 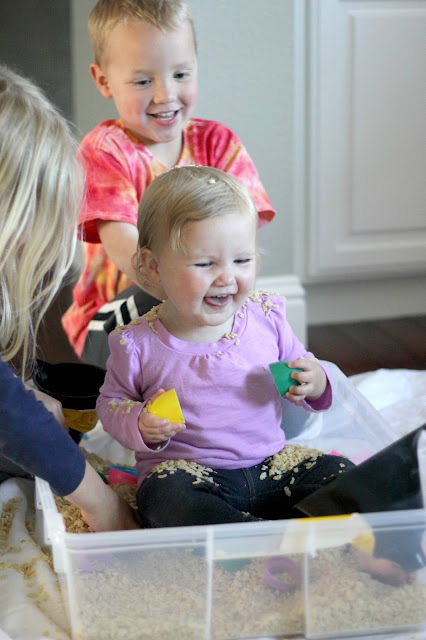 If I were doing this activity with a large group I would encourage the kids not to snack... or set up a different area with bowls where they could go grab a cereal snack if looking at all of this cereal starts making them hungry. My big kids had fun joining in with this activity too. 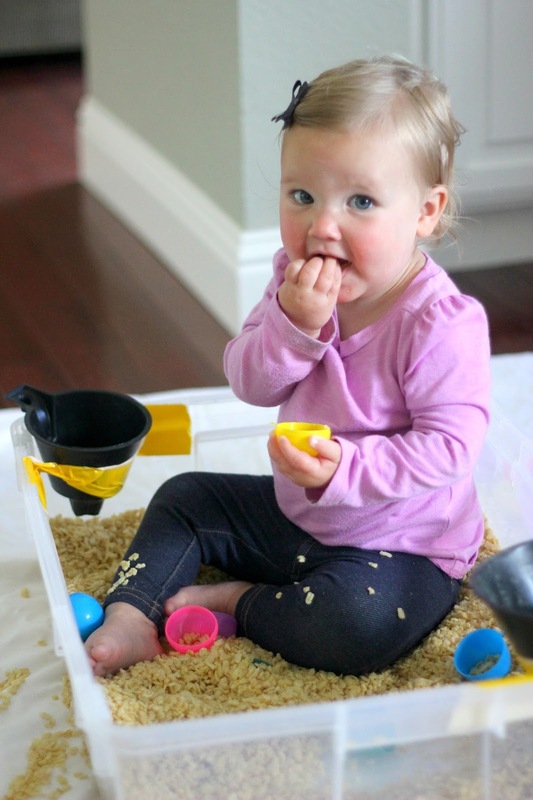 I set rules for how to play with the sensory bins... but sometimes I break my own rules. Pouring the cereal on her head was so fun/funny and she was hysterically laughing and so were the other kids, so I went with it. Obviously every parent has their own mess tolerance. I covered the floor with a sheet when we start so clean up was really easy. I just shook off the sheet in the sink and the kids vacuumed any remnants on the floor. 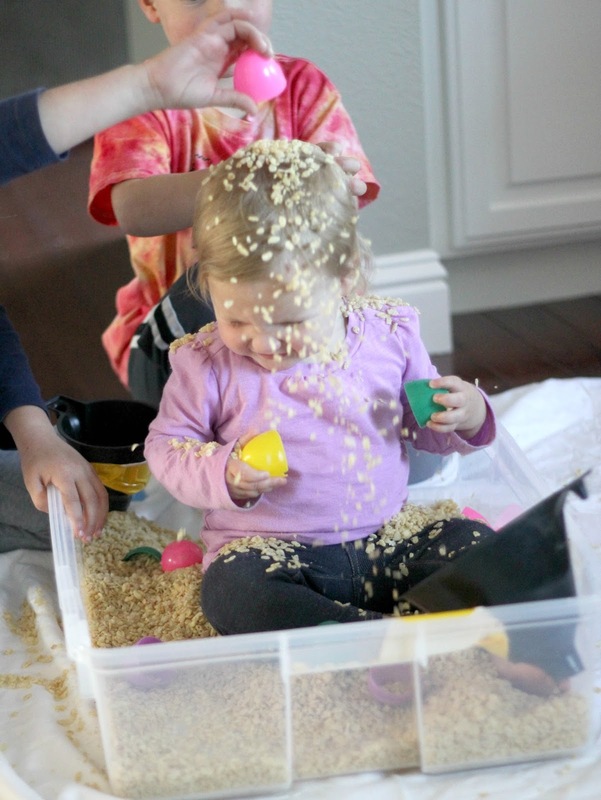 Such a quick and easy clean up and the joy on their faces was worth that extra 2 minutes of clean up. Would you let your kids do this? Are you crazy like me? LOL. 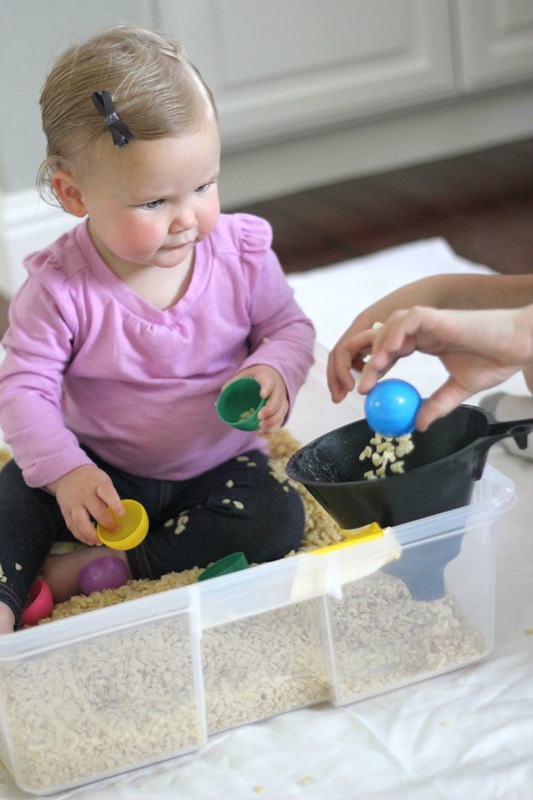 Have you tried any of our other Easter activities yet? We are on Day 5 and you can click on over to our A Very Toddler Easter main page and see all of the activities in one easy spot. So far the Toddler Egg Roll has been my absolute favorite! You can even see some video footage of it here. If you tried any of these, what has been your favorite? Or what do you still plan to do?